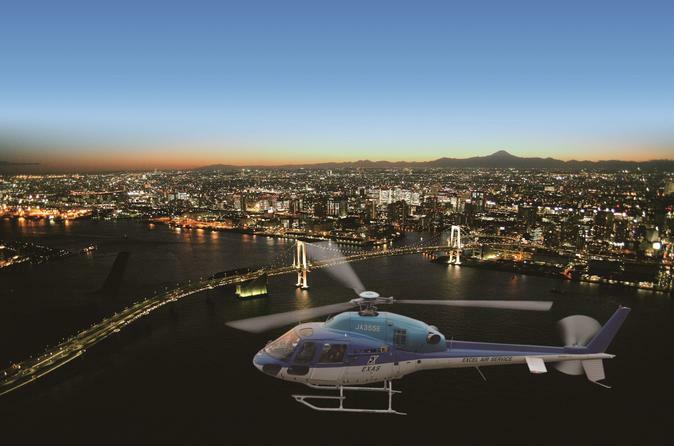 Experience an exhilarating and memorable helicopter flight over Japan's capital, Tokyo. Fly over Maihama resort area, where the Disney Resort is located, Tokyo station and make a circle around Tokyo Skytree. For 15 minutes, enjoy breath-taking views of the city from high above. Safety instructions will be provided just before the flight, so even if it is your first time in a helicopter, please don't be nervous! Both day and night flight options are available and a complimentary Boarding Certificate to commemorate tis unique experience will be handed out upon the completion of the tour. Limited spaces available per flight, so hurry up and get booking! Experience the city like you have never seen it before on this once in a lifetime experience thanks to Tokyo Sky Cruise. For 15 minutes, cruise around this incredible metropolis and try to pinpoint as many landmarks that dot the landscape as you can. Tokyo Sky Cruise offers a day time option and a night time option with take-off times different depending on the month. Enjoy a bird's-eye view of Tokyo taking advantage of the helicopter's large windows and 600-meter panorama view. Admire incredible vistas of Tokyo as your helicopter hovers over some of the most symbolic landscapes of the city including The Imperial Palace, Tokyo station, the Sumida River, Kaminari-mon gate in Asakusa, Ryogoku Kokugikan Sumo Hall, Tokyo Sky Tree and more. Discover a different side to Tokyo when the city is gorgeously lit by the setting sun, or as the bright lights from the buildings illuminate the night sky. Look forward to seeing some of the famous landmarks glittering from below and observing the numerous entertainment districts as they gear up for the evening's shenanigans. To reach the Tokyo Heliport, you can either head there directly by yourself or catch a free 10-min shuttle bus from JR Maihama station on the Keiyo Line (departing every 20 minutes from 4:00pm). Complimentary tea and coffee are available at the Heliport (other drinks charge a fee) while you wait for your flight and a Boarding Certificate of your trip is provided to mark your unforgettable experience! ※Please inform us your phone number that can be used in Japan using "Special Preferences" field at the time of booking. If you do not have one, let us know the name of your hotel, check-in date and the name the booking is under, as we need it to complete the reservation.